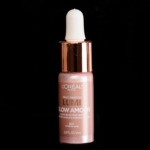 L'Oreal True Match Lumi Glow Amour Glow Boosting Drops is a highlighter that retails for $14.99 and contains 0.28 oz. There have been 2 shades released, which you can select from below or jump to these sections: Review, or Description. Add a drop of glow to your complexion with new L'Oreal's True Match Lumi Glow Amour Glow Boosting Drops. These revolutionary drops of highlighting pigment illuminate skin to create a highlighted, dewy glow look. Apply alone or add a drop into your favorite skincare, foundation and makeup products to customize your glow complexion. The ultra-lightweight formula has a thin texture allowing for buildable luminosity. 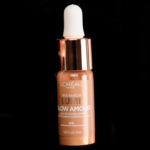 True Match Lumi Glow Amour Glow Boosting Drops are infused with shea butter to provide your skin with rich hydration. These versatile highlighting glow drops can be worn by all skin tones.